MOTION’s aural/sonic works span the realms of word, sound and drama. Her lyrical agility has taken her to the stages of Manifesto, the Caribbean International Literary Festival, Toronto’s Nuit Blanche, CBC Television, Illinois Hip Hop & Punk Feminisms Symposium, Trinidad & Tobago’s Cascadoo Festival and HBO Def Poetry Jam. Her theatrical works have been staged at Factory Theatre, bcurrent’s Rock.Paper.Sistaz Festival, Buzz Festival at Theatre Passe Murialle and Obsidian’s International Black Playwrights Festival. Motion is Resident alumna of the renowned Canadian Film Centre, and has been Obsidian Theatre’s Playwright-in-Residence, and a resident of the Banff Centre for the Arts’ Playwrights Colony in 2013, where she developed the dramatic suite 4OUR WOMAN. 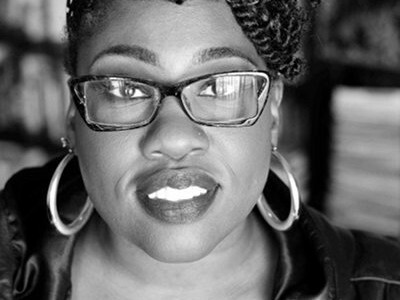 Her award-winning production ANEEMAH’S SPOT debuted at Summerworks 2012. She went on write the critically acclaimed site-specific theatrical co-creation NIGHTMARE DREAM, which premiered in the 2014 TD Then & Now Festival. The 2nd work in the Nightmare Dream trilogy BECAUSE I LOVE YOU, will have its main stage premier in the 2014-2015 Season. Her inter-disciplinary play ORALTORIO, and films SOUNDGIRL and Aneemah’s Spot are now in development. Motion has published two collections – Motion in Poetry and 40 Dayz (Women’s Press). Her work has also been featured in Give Voice (Playwrights Canada), The Great Black North (Frontenac), and In the Black: New African Canadian Literature (Insomniac). Inspired by her initiation as an arts/mentor with the legendary Fresh Arts Movement, MotionLive continues developing young and emerging talent through her presentation/ workshop series in community, creative and educational spaces such as South Africa’s Africa Expo Symposium, Tapestry Theatre, the AMY Project, Trinidad & Tobago’s Cascadoo Festival, Toronto Public Library, York University and the TDSB. This year, Motion joins the Hip Hop Curriculum Project in the newly published Rhymes to Re-Education (A Different Publisher).